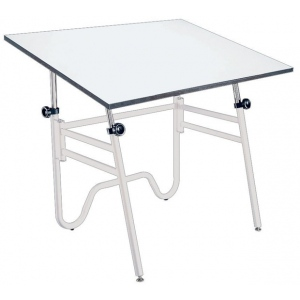 Extremely versatile the Opal table folds to approximately 5" in width for easy storage. * The Opal features a unique oval and round tubular base design for stability. 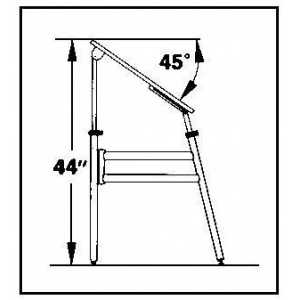 * Board angle adjusts from horizontal (0°) to 45° with an adjustable height of 29" to 44" in the horizontal position. * Base is 1¼" diameter steel tubing. * Distance between legs is 28¾". * Unique double-bend back legs. 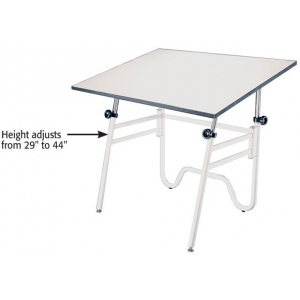 * Warp-free white Melamine tabletop with black vinyl edging. The base color is white/ivory.